To a place never seen by most. And tin cans cast upon the ground. It’s not enough to last the week. Frozen in the frigid nights. Their smiles beam like the newly risen sun. And she walked with me. The above poem was written by Kristine Hardy, a Canadian student who visited the an impoverished barrio in the Dominican Republic in 2008. 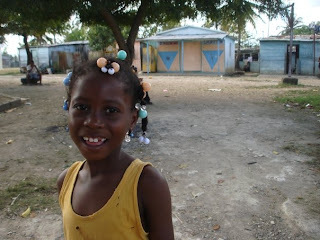 Bateyes and Barrios are two of the types of areas in which Dominicans and Dominicans of Haitian decent reside. Both terms' descriptions generally discuss impoverished, underdeveloped areas. The areas where the sugar cane cutters live and work are called "bateyes", which you can learn more about here. However, the above poem discusses life in a "barrio", a word that often implies that the poverty level is high in such a neighborhood.